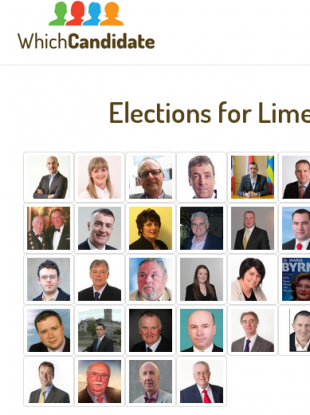 A one-stop-shop for Limerick voters that tells you what candidate best matches your views. PEOPLE LEAD busy lives these days, with many people leaving it to the last week before an election to even begin to contemplate who they might vote for. If you live in Limerick, fear not, there’s no work for you because the Department of Politics and Public Administration in the University of Limerick has designed a website that matches you to the candidate that share the same views as you. Speaking to TheJournal.ie, lecturer Rory Costello said the rationale behind the website was to make it easier for voters to find out what candidate suited their ideals, stating that you go to the internet to find out all sorts of information, so why not about who you should vote for? “Most people vote for candidates because they know them or they are locals, but often people don’t know all that much about what they stand for. They call to the door and they speak maybe about one issue and people don’t get to see them as a full package,” said Costello. The website, WhichCandidate, works by the research team selecting a set of relevant policy issues in advance of the election. Election candidates are contacted to complete a questionnaire on these issues. Each participating candidate is given a public profile on the website, incorporating their answers to the questionnaire. The voter then selects what their constituency is and then answers a least of questions that relate to their area. After filling in the answers they then collate the results and state which candidate you are most matched with. “People go to the internet to research what car to buy, what music they like, what books to read, so why not what candidate they can vote for?” asked Costello. “It’s a simple mechanism that takes the hassle out of having to ask all the questions,” he said, adding that they hope to have a website of its kind rolled out nationwide for all areas for the general election in 2016. He added that it actually isn’t that easy for constituents to get information about each candidate, stating that a lot of canvassing material simply doesn’t go in depth into the issues stating that independents are put at even more of a disadvantage as they might not have the resources to circulate as much material as party candidates about what they are all about. If you’re from Limerick and are planning on voting – this one-stop-shop could save you a lot of time, said Costello. WhichCandidate is not associated with any political party or election candidate. Email “Voting in Limerick, but not sure for who? This will help”. Feedback on “Voting in Limerick, but not sure for who? This will help”.